Engraving, Anonymous, possibly by René Boyvin?, 25.5 x 47.3 L (New York). Inscribed on the cornice of the base of the central column: •ROVS • FL_• INVEN •; on the ring supporting the lamps above the Virgin’s head: Kkk Gabriel Fesis zz [ex? ]; and in the lower left corner, a monogram composed of the letters A and C or G and possibly also F (on the last two inscriptions see below). Brulliot, 1832, 27, under no. 199, as by Gaspare Osello. Robert-Dumesnil, VIII, 1850, 19, no. 5, as Boyvin, after Rosso. Le Blanc, 1854-1890, I, 506, 5, as Boyvin, after Rosso. Levron, 1941, 19, 74, no. 162, as shop of Boyvin, after Rosso. COLLECTIONS: Florence, 13660ss. London, W3-123 IMP. SIZE. (spotted). New York, 32.92.27 (2). Paris, Ed 3 (with note that the wm. is a fleur de lys); SNR (right fourth cut off). Vienna, F.I.3, p.2, no. 3; It.II.21, p.64. Vasari, 1568, II, 308 (Vasari-Milanesi, V, 433), as “una Nunziata bizarra” by Boyvin after Rosso. Mariette, Abécédario, 1858-1859, as Boyvin after Rosso. Carroll, 1961, 452, Fig. 14 (Paris, Ed 3), 454, as by Boyvin or his shop after Rosso. Carroll, 1964 (1976), II, Bk. II, 436-437, 440f., n. 1, Bk. III, Fig. 136, as by an unknown printmaker. Béguin, in EdF, 1972, 187, under no. 212, and in Fontainebleau, 1973, II, 65, under no. 212, as by Boyvin. Zerner, in EdF, 1972, 251, under no. 267, and in Fontainebleau, 1973, II, 79, under no. 287, mentioned. Borea, 1980, 262, no. 673 (Paris, Ed 3), as Boyvin. Carroll, 1987, 44, 186-187, no. 61, with Fig. (Vienna, F.I.3, p.2, no. 3). Carroll, 1989, 19-20, Fig. 38 (F.I.3, p.2, no. 3). Acton, in French Renaissance, 1994, 308-309, under no. 74, as after Rosso by an artisan of the School of Fontainebleau. 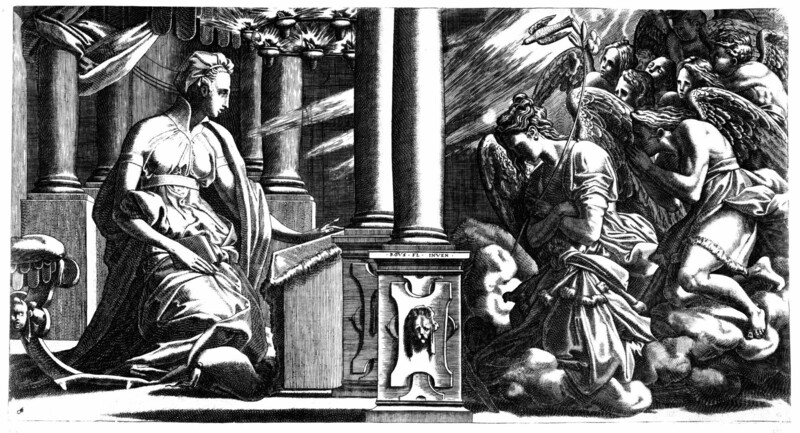 This engraving very closely reproduces, in reverse, Rosso’s drawing of the same size in the Albertina, done possibly in 1531 or 1532 (Fig.D.43a). It is also related to the very accurate copy of that drawing in the Ensba, Paris (Fig.D.43 Copy). However, certain details, such as the Virgin’s profile and the precise character and placement of the five flaps of the canopy above her head, seem to indicate that the model from which the print was directly made was Rosso’s original drawing and not the copy of it. The original drawing shows the pressure marks of a stylus along its major outlines, which could have been made to transfer the design to the engraver’s plate, although they could also have been made to produce the copy in Paris. 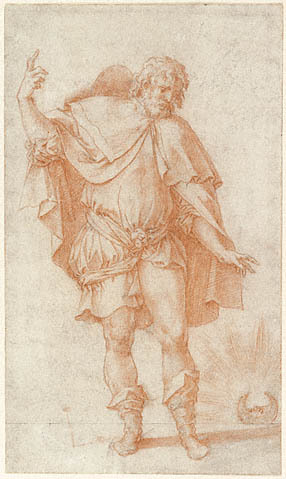 Rosso’s authorship of the design of this engraving is assured by his authentic drawing in the Albertina. However, the attribution of the print itself to Boyvin is not so certain. It goes back at least as far as Robert Dumesnil’s catalogue of 1850, where he gives the inscription on the chandelier as Kkk Gabriel Fesis ex. He makes no comment on this inscription but suggests that the monogram in the lower left corner refers to the name of the editor of the print. Le Blanc repeated this opinion. Levron, 1941, 19, 74, gives the print to Boyvin’s shop and indicates that it is datable before his conversion to Protestantism, which, apparently, took place in the mid-1560s. 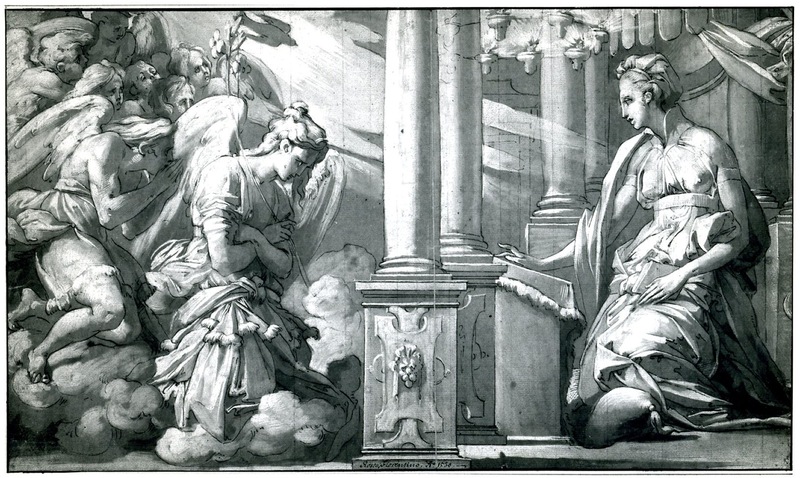 The Uffizi has catalogued its impression of this engraving as by Antoine or Augustin Garnier, and in 1832 Brulliot indicated that the monogram may indicate the engraver Gaspare Osello. Nagler, Monogrammisten, I, 1858, 936-937, no. 2212, suggests that the monogram could refer to Osello, to Gabriel Fesis, or to Jacques Androuet Du Cerceau. The cutting of this print, especially the extensive use of stippling and the somewhat ragged way that the feathers and hair are engraved, does not seem very close to Boyvin’s manner, either in his signed prints or in those most closely related to the latter. Furthermore, the inscription and the monogram on the print would seem to indicate a connection with another engraver. 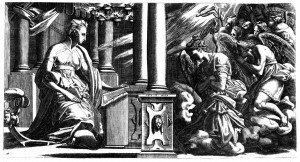 It is true that the print appears to be the “Nunziata bizarra” that Vasari knew and gave to Boyvin. 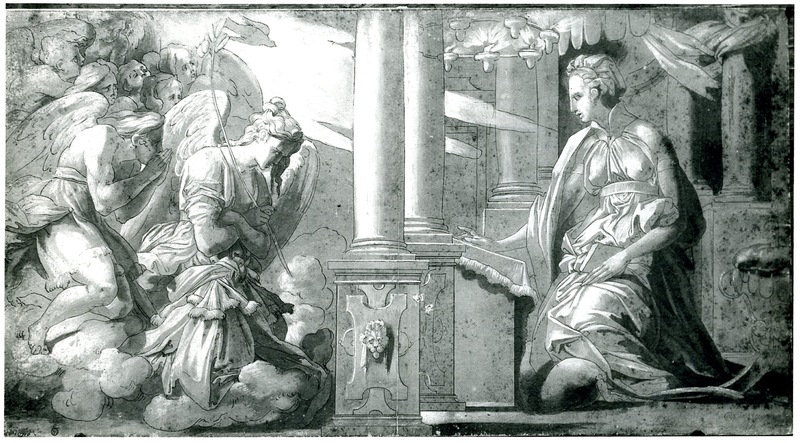 But we also know that Vasari was not well informed on that engraver’s activity. However, it can be concluded that the print was done before Vasari concluded the writing of the 1568 edition of his Lives. Of the suggestions that have been made as to its authorship, Du Cerceau is not really possible because his style is so different and he seems only to have been an etcher. Antoine Garnier (1611-1654) was active too late to be the engraver of this scene. His father, Augustin, was born too late, in 1579. 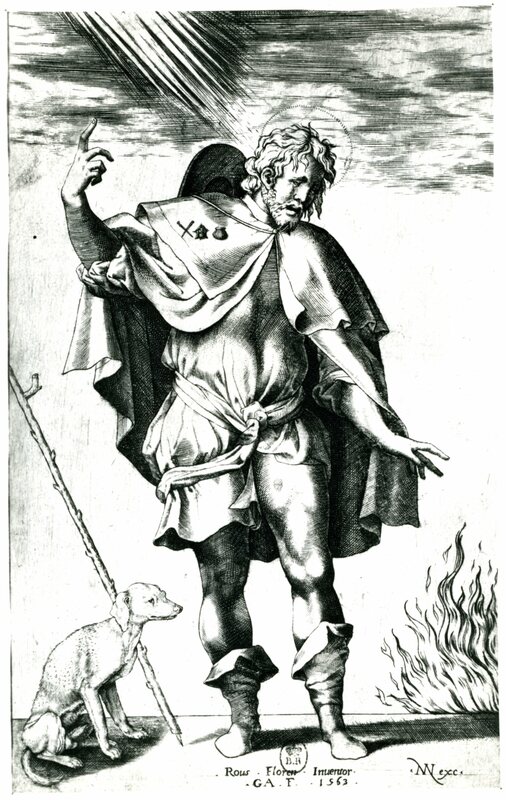 Osello was active at the right time, but his St. Roch (Fig.E.106), after Rosso’s Empedocles-St. Roch (Fig.D.80a) by way of Boyvin’s engraving (Fig.E.16), does not, in its execution, resemble the Annunciation. 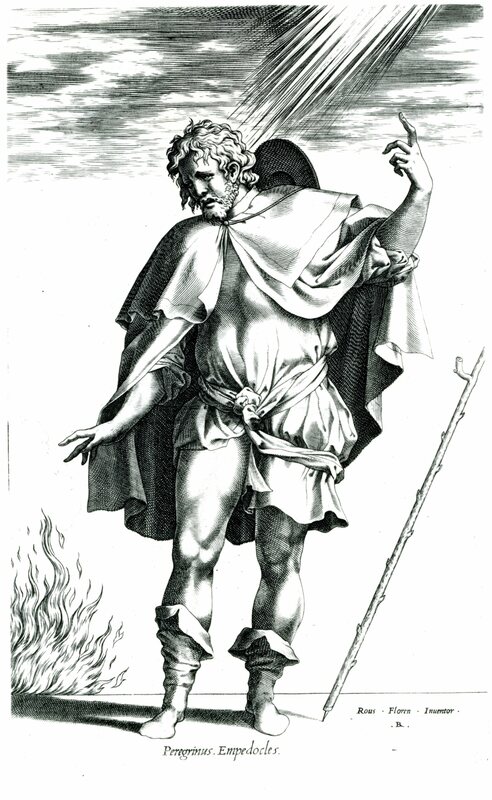 Gabriel Fesis, whose name may appear on the print, was, according to Nagler, an artist active in Paris. This needs to be investigated.